Set the mood with scent! With the Aromatherapy Diffuser from our friends at The Pure Company, you can fill your home with scents that energize, calm, or help focus your attention. At the press of a button, a nice, quiet hum starts a mist that sends the essential oils into the air. There are several settings that you can choose from: low or high mist, mood-enhancing white LED light on or off, and a timer setting for 2, 4, or 6 hours. Smartly, if you decide not to set the timer, there’s an automatic safety shut-off when the tank empties. The Pure Company offers some amazing blends of scents that are made up of 100% pure (see why they named themselves the Pure Company!) essential oils that are not diluted with base oils or fillers. We tried the Comfort scent (clove bud, lemon, cinnamon, eucalyptus, rosemary, lavender, and cedarwood), Fresh scent (rosemary, lemon, bergamot, and peppermint), and Clarity scent (lemongrass, rosemary, spearmint, and grapefruit) and loved them all! An added bonus is that The Pure Company is designed by a team of innovative women who create these functional products that look beautiful, are easy to use, and work efficiently. 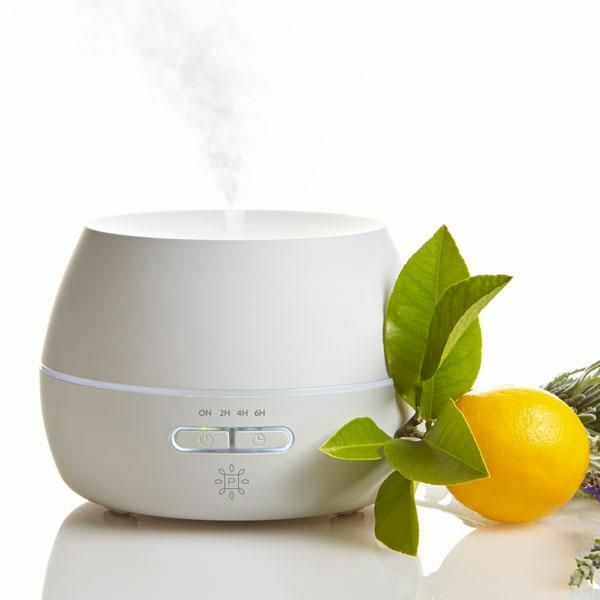 Enjoy the power of scent with The Pure Company Aromatherapy Diffuser!